INTELLIGENT COMPUTING codeigniter helper_model php Programming Faster your web development with Helper_model in codeigniter. 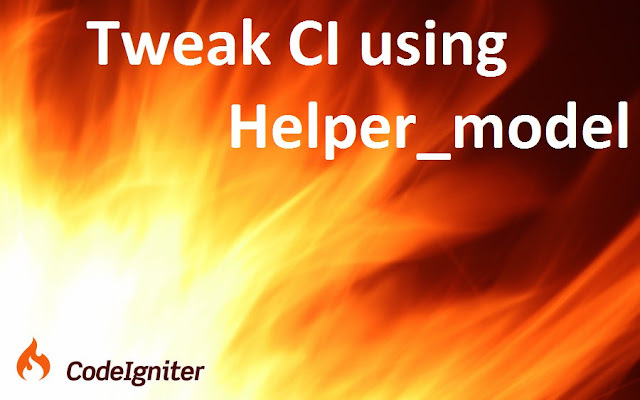 Faster your web development with Helper_model in codeigniter. Hi folks out there, Dheeraj here with a complete new series of coding course on Intelligent computing. During these time i was proceeding on programming and with as you know, programmers are too lazy to write same code again, i solved problem by creating few function that helped me to reduce development and coding time straight by 30%. If you are PHP Developer and using Codeigniter and is in Codeigniter development, great with MVC architecture of PHP development, luckily you got awesome information over here. I would like you to introduce "Helper Model" (that’s what it does for me) and today i am going to tell you how to integrate in your codeigniter application. First of all, visitGithub to view and download helper_model.php file. You may download it or may get the text and create new local PHP file named Helper_model.php and save it. Once you get the fresh copy of Helper_model.php, save it inside your models folder of your Application directory in codeigniter. to make it easily available in all of your application, lets just autoload this. · add this helper_model and make snynoms what you like. What this will do is, load helper model in all of your application automatically and let you use by having to write "lib" instead of Helper_model. You can specify any small alias you wish. Data from table will be fetched and returned in $table variable if number of rows retuned is greater than 0. In next few post, will be explaining use of each function of helper model, and i bet you'll be saving lots of your time. If you understand helper model and wants to share with us or wants to further develop, fork my code and ad your functions to it. Share this post with your programmer friends and be first to like/follow us on facebook and twitter.